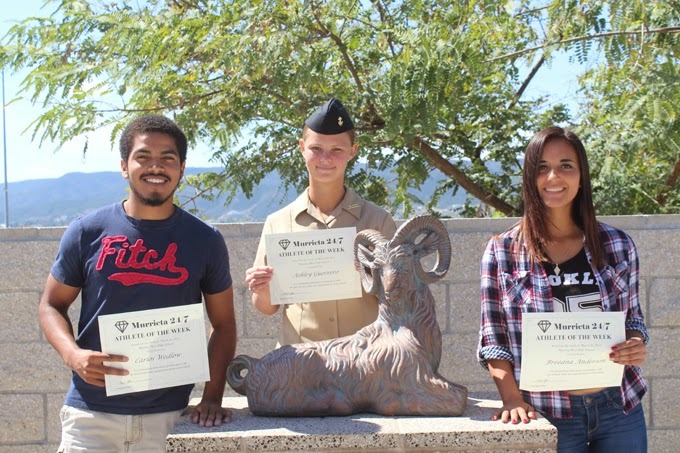 From left: Carlos Wedlow, Ashley Guerrero, Breena Anderson are the Murrieta Mesa Athletes of the Week. Ashley Guerrero has excelled as a freshman on the girls lacrosse team. She scored her first goal in the recent Birmingham Classic tournament. She also filled in at goalie when the starter was injured and made 8 saves in a 7-4 win over West Ranch High of Valencia, putting the Rams in the consolation championship game of that tournament. She is a member of the ROTC unit on campus as well. Softball player Breeana Anderson hit over .400 in a recent tournament and has played great defense, according to coach Tony Romero. Carlos Wedlow had a big day for the boys track team in a recent victory over Murrieta Valley. He ran 10.99 in the 100 meters and was a part of both 4x100 and 4x400 relay teams. These athletes will be eligible for selection as Murrieta Mesa High School's Athletes of the Month, which will be announced in early April. Anyone wishing to order a glossy print of this article with photo may do so by emailing murrieta247info@gmail.com.